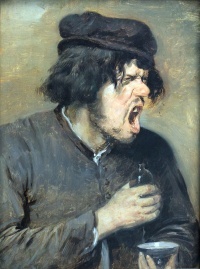 The Bitter Potion is an oil on wood by Flemish painter Adriaen Brouwer. It depicts a “low-life” young man with a grimacing face holding a bottle of medicine in his hand. This type of painting is called a tronie. It is a textbook example of Flemish genre painting and an excellent way to illustrate disgust, perhaps only equalled in poignancy by the noted self-portraits by Oscar Gustave Rejlander, which I’ve posted before. The Bitter Potion is World Art Classic #300. This entry was posted in Uncategorized and tagged everyday life, Flemish art, genre painting, realism on October 19, 2013 by jahsonic.